Unfortunately, screen windows frames break. It could be due to over use, inappropriate use, a pet that tried to run through it or it may have been damaged in a storm. What ever the reason, it may be difficult to find a new one that properly fits and at a reason price. That’s where we come in. 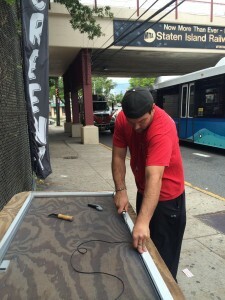 Amboy Locksmith and Screens provides custom window screen repair. We custom make screen frames to precisely fit your windows or doors. Whether you need one or several screen frames replaced, we can custom make your screen frame at a rate cheaper than purchasing new one’s from the manufacture. Call today at 718.984.1300 or 718.984.2400 for more information and we’ll give you the best price in Staten Island on making your custom screen window frames.